When I found out that I was going to Dinner this Saturday I have to admit to being a little concerned…. I mean I love an adventurous menu but what an earth is ‘Meat Fruit’, or ‘Rice and Flesh’? 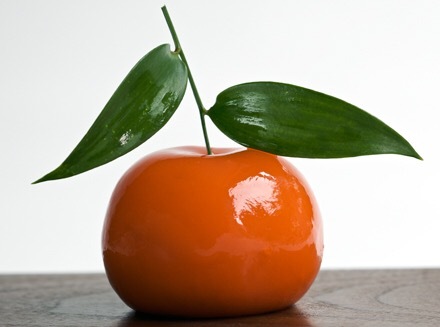 I have never had a yearning for food from the 17th or 18th centuries, and am at times turned off by the formality of a Michelin Star ( and Dinner is one of only 11 London restaurant awarded 2 prestigious Michelin stars). However, WOW, WOW, WOW, I 💞 it- the food, the service, the ambiance, the whole caboodle!!! 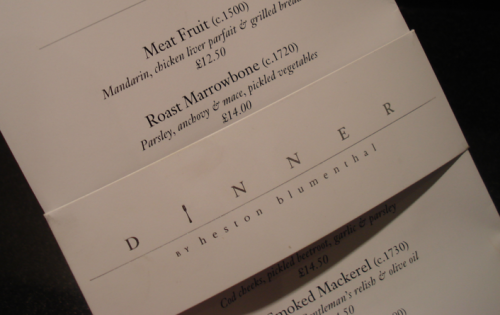 Heston himself was there having lunch with a group of friends. It must be a good sign when the creator of the concept is happy to have a relaxed Saturday lunch there. I didn’t take a lot of photos as I was worried it wasn’t allowed…. However, I saw other people doing so and decided to do so from main courses onwards. So let me tell you all about it! My dining companion had the famous ‘Meat Fruit’, pictured here. It is a chicken liver parfait within a mandarin concoction which I couldn’t quite figure out- not a jelly like substance, quite like the texture of a really fresh mandarin. It was really gorgeous, rich and savoury, with extra toast for the pate. I had the Earl Grey Tea cured Salmon, which was utterly lovely. There was a salad of chicory and sorrel, a lemon salad, gentlemans relish and salmon roe. I thought it was so pretty and went so well with the vintage, rose champagne being consumed…. 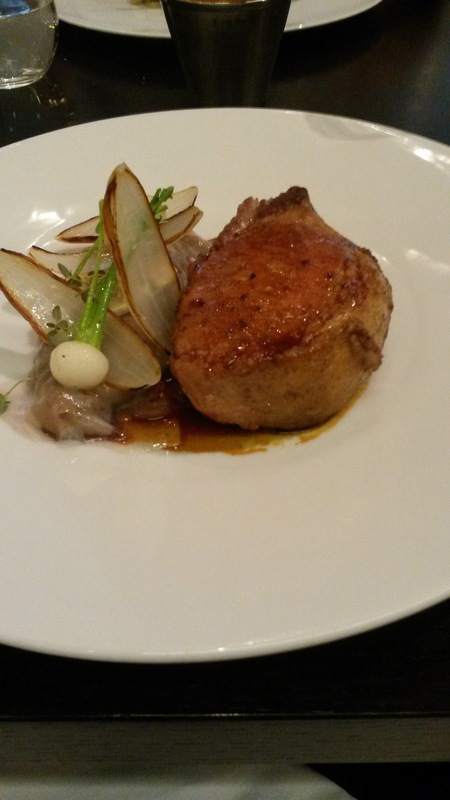 I decided to try the Iberico Pork Chop as I have not had Iberco pork before, and it was really good. There was a little spelt and ham stew wrapped in Lardo on the side which was really amazing, made even more tasty with the Robert sauce. I loved it! My dining companion decided to have the Spiced Pigeon with ale and artichokes, and (of course) triple cooked chips on the side. The pigeon was a real picture on the plate and was declared to be a great success. The chips were nice, but I have had crunchier, groovier chips I have to admit. 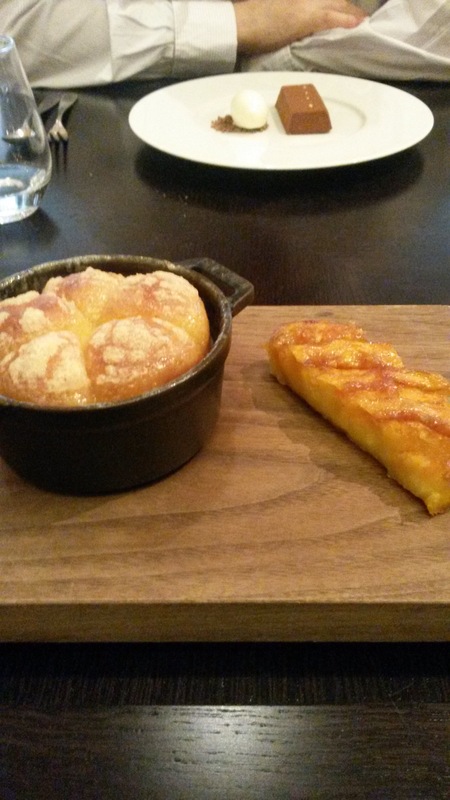 We weren’t going to have dessert but the waitress told me that the Tipsy Cake with spit roast pineapple changed her life when she first tasted it 2 years ago- how on earth could I say no to that!!! The cake was like a brioche and dowsed in something lovely and boozy! 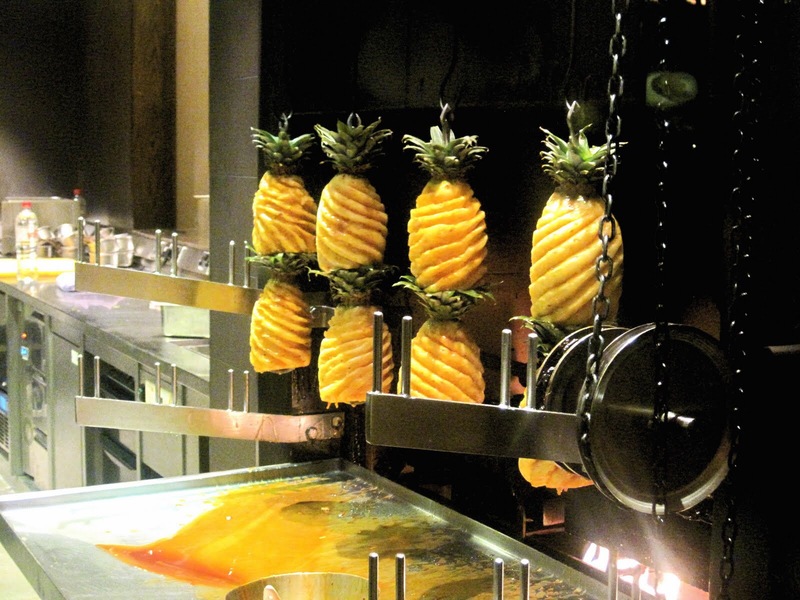 I was watching the pineapples roasting on their spit and couldn’t have left without trying. On the other side of the table was the Chocolate Bar- with passion fruit jam and ginger ice cream. Mine was definitely the best! So, a great lunch in a great restaurant with yummy food and delightful service. Would I go back? Definitely! Now to find someone rich to take me back……. I’m having a few days off work and have done some relaxing and recharging of the batteries. Carluccios in Teddington for a nice lunch though, but a snooze meant early pjs and a pizza night. 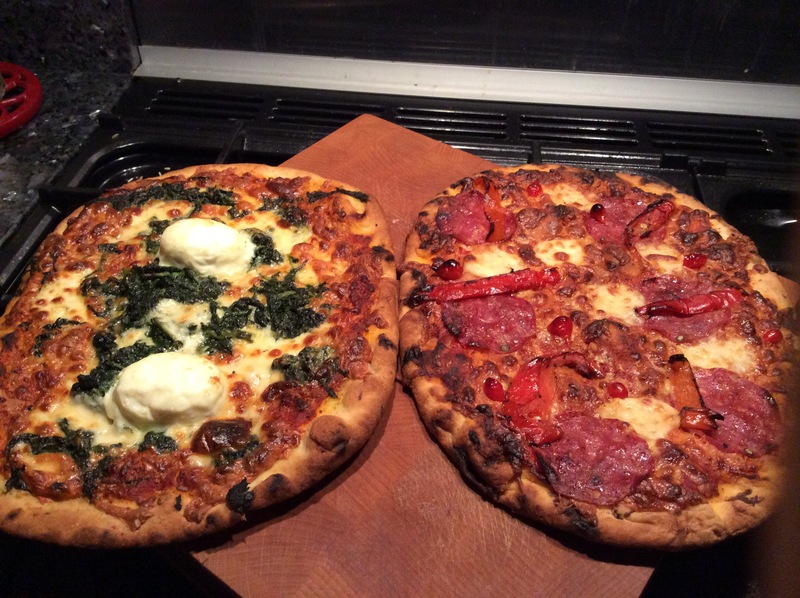 I should claim I made these pizzas but must admit I bought them from M&S. Left hand Fiorentina for me. Right hand salami for C.
I normally love these pizzas but there was meant to be a runny egg on the top, and it went hard even though I only put it in the oven the right amount of time. OK though, but a little disappointment. Tonight there are so many fireworks in Twickenham. You will know how much I adore fireworks so a happy night. I think it is the dark evenings in Autumn that make me crave some comfort, and pies fit the bill! 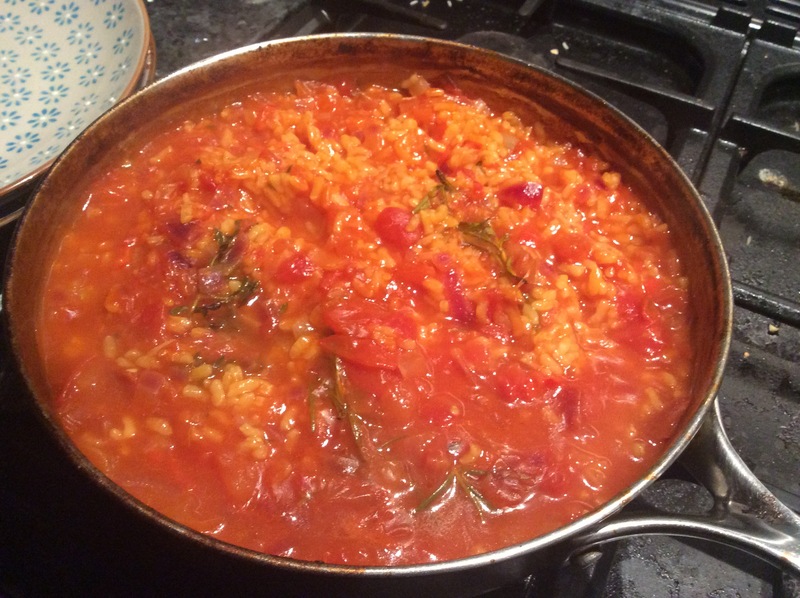 In the past I had a whole repertoire of recipes but now I am trying to avoid eating meat I have had to go back to the drawing board…. But 1 new pie tried at the weekend and an old fave eaten this evening. Not a massively attractive pie I must admit but really tasty! I made a mixture of sautéed celeriac, onions, cooked chestnuts and mixed nuts and popped it into some shortcrust pastry. Brushed with an egg and popped in the oven for 30 mins. 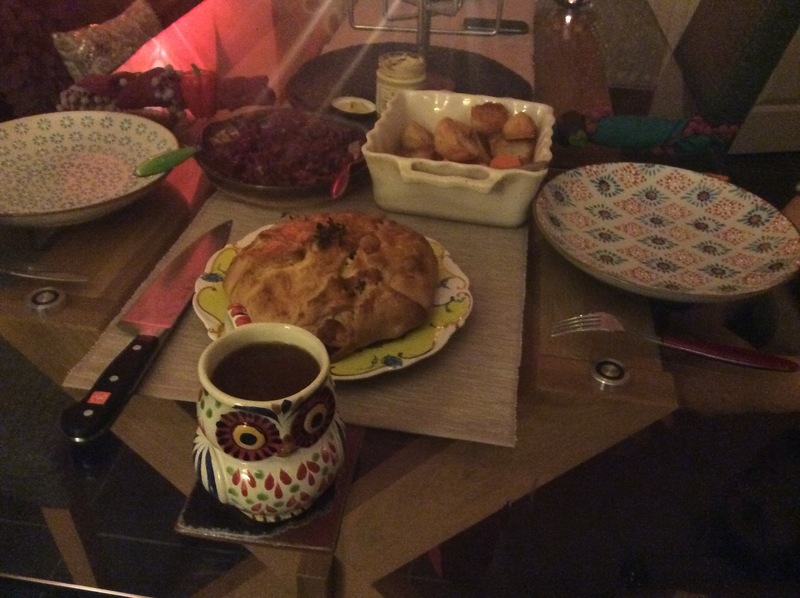 Not eating meat makes you miss gravy so I have to admit there was some meaty stock in the gravy (in the cute owl jug! )- so it seems I need to master the art of veggie gravy. i made this at the weekend instead of a Sunday roast. It was actually our 7year wedding anniversary so some good red wine was also consumed- and even though the weather was oddly, eerie foggy, it was a damn site better than our wedding day…. No umbrellas needed today! 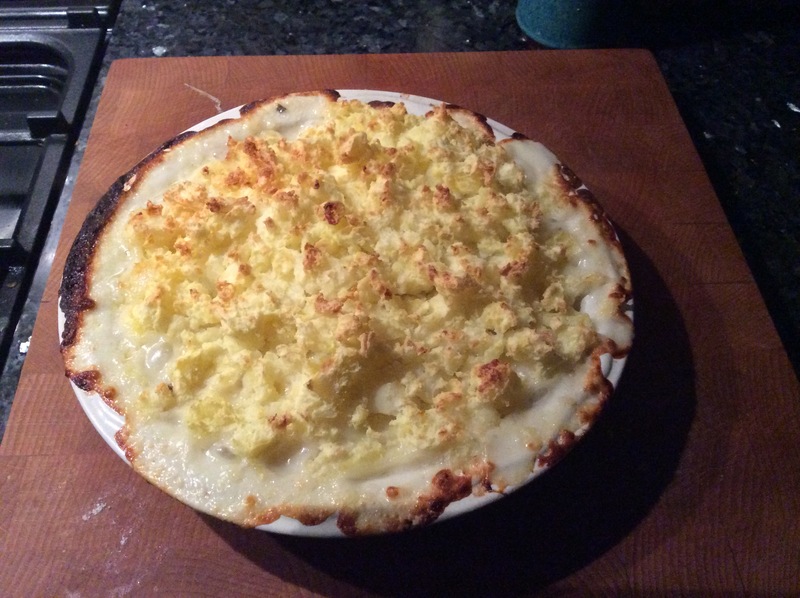 This fish pie is straight from a recipe by Nigel Slater, although instead of seafood mixed in with the white fish I use a fish pie mix from work (loving prepared at my fish counter this evening…). I made a white sauce with some prosecco and the milk/water mix I poached the fish in first. Topped with mash this has been a lovely end to a quietly calm day. I know my Dad would love this so I dedicate it to him, recovering back home after heart surgery. Well done Mr French, I am glad the op didn’t dent your appetite!! I have 5 days off work now, and I can’t wait for the lie in tomorrow morning. Lots to do but looking forward to it. 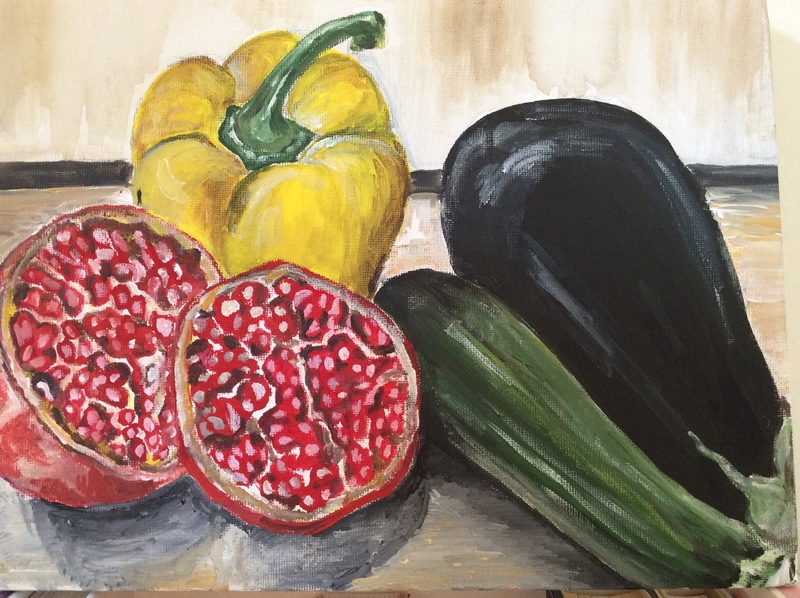 And finally, a great friend of mine has painted this for me…. I love it, thank you, you have a real talent. I have only been to Basingstoke twice in my life, today being the second time, and each time I get horribly lost- I go round and round in circles for what seems like hours! It actually reminds me of a time in Seville when I’d given up hope of ever finding the apartment again…. However, after being rained on I had a lovely catch up with a colleague in a very sweet tea shop, so worth the journey all in all. Maybe my next trip to Basingstoke will be third time lucky? ✨ in a heavy pan that can go into the oven, heat the oil and fry the onion for a couple of minutes until softened. Add the tomatoes for a minute or two, and then stir the rice into the pan. ✨ pour in the wine and reduce for a couple of minutes. Add the rosemary and the thyme. Put over the stock, season, cover with a lid and pop into the oven for 25 mins. I took the lid off for the last 2 mins to reduce the liquid a little further. 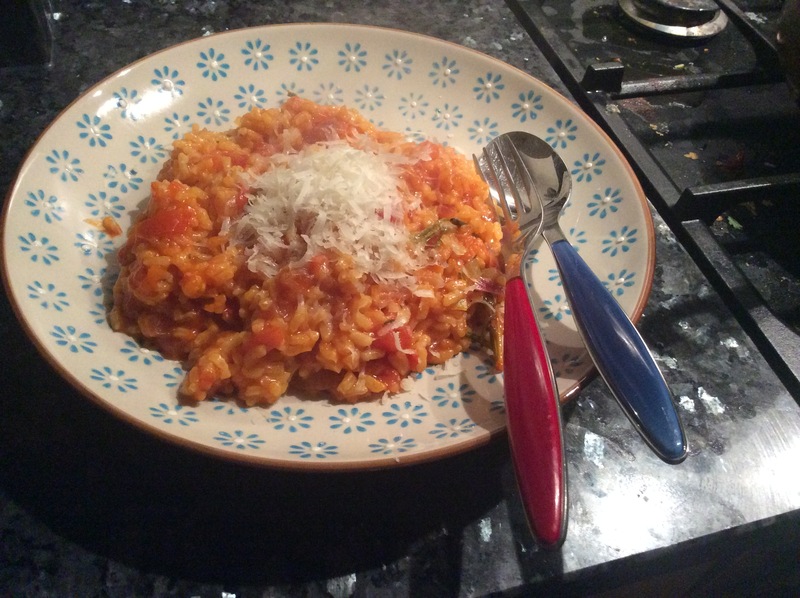 I have to admit to being a little sceptical about cooking a risotto in the oven but it really was lovely and will be a permanent feature in the French Thomas kitchen!